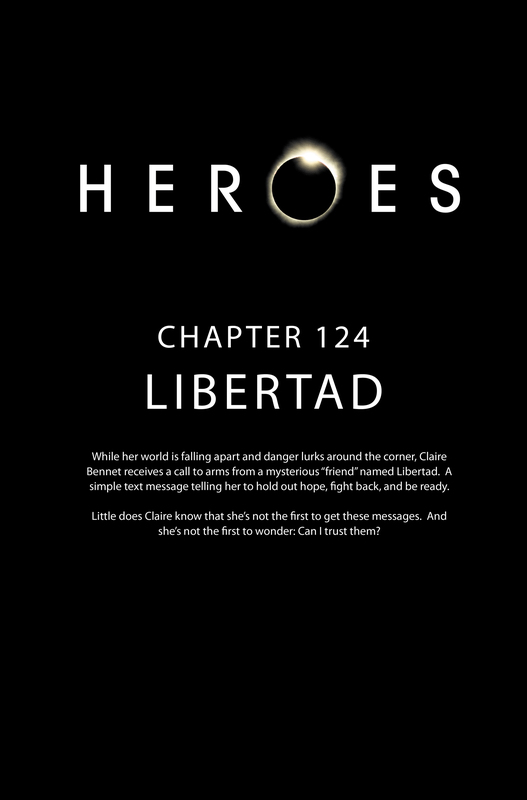 While her world is falling apart and danger lurks around the corner, Claire Bennet receives a call to arms from a mysterious "friend" named Libertad. A simple text message telling her to hold out hope, fight back, and be ready. Little does Claire know that she's not the first to get these messages. And she's not the first to wonder: Can I trust them? In front of the Angry Skunk Bar, a trafficker named Misha is talking to Harmon, telling him to be careful because people are disappearing. Then Angie, a waitress, turns up late for her shift. Misha heads inside the bar, and takes a seat, and another trafficker asks Misha if they can help Maya for a new identity. They offer one for $7,000, offering less if she knows any tricks. Maya says she used to, but not anymore, and says she would pay $4,000. Misha doesn't understand why they would hunt someone without abilities and shows off his ability. 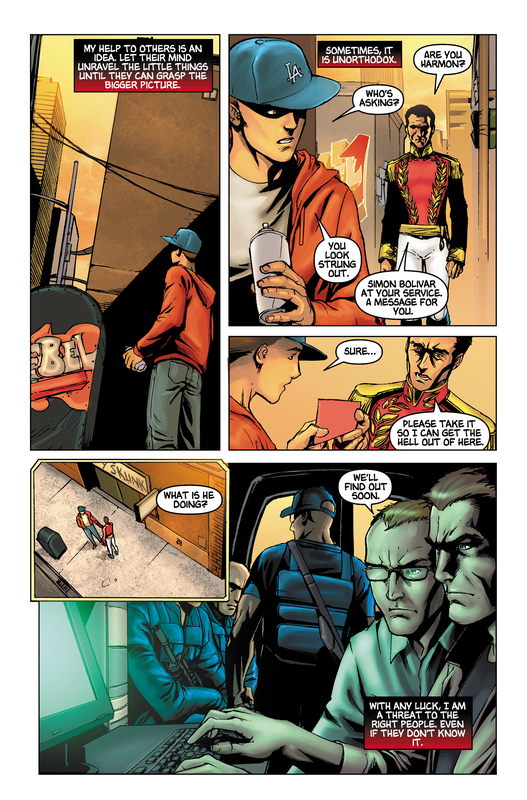 Outside, after Harmon has tagged a mailbox with 'Rebel', a man in uniform, Simon Bolivar, finds Harmon and delivers him a message: "Viva Libertad, Rebel & Be Saved". Meanwhile a technician and a group of armed agents are watching from a van nearby. 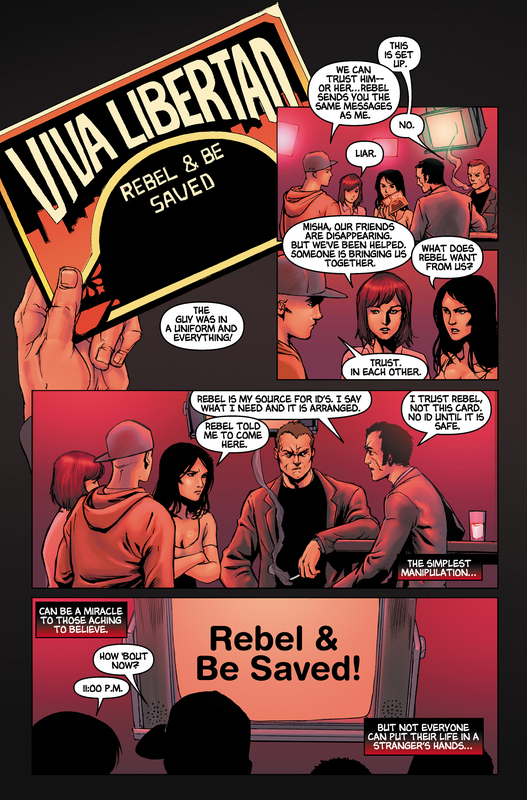 Inside the bar; Harmon, Angie, Maya, Misha and the other trafficker discuss whether to trust Rebel or not, when the message appears on the TV screen. 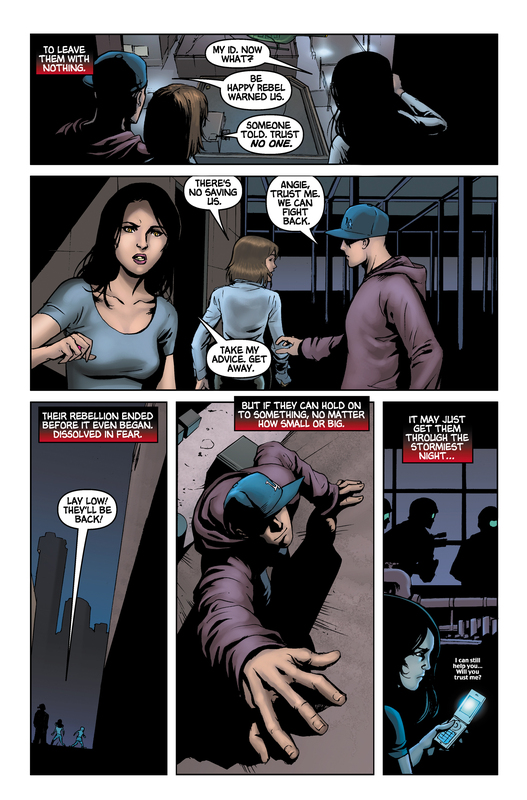 Misha and the other trafficker are captured on the street, and have the meeting location of Harmon, Angie, and Maya beaten out of them. 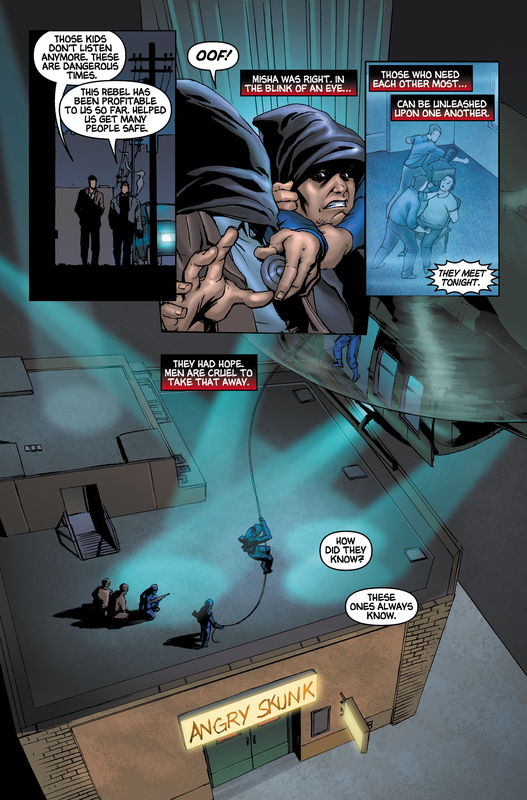 While Danko's team arrives at the roof of the bar, the three escape. Harmon runs away by crawling the wall. Angie and Maya both also manage to escape, while Maya receives another message from rebel, saying that he can still help and asking if she will trust him. While walking to work the next day, the van with the agents starts to close in on Angie, but Rebel warns her, and tells her to run. 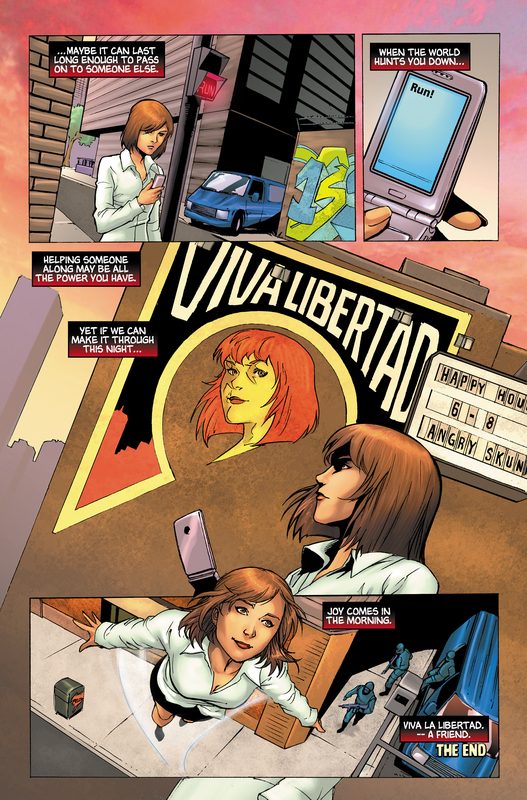 She sees herself on a Viva Libertad poster, and flies away as the agents pour out of the van. Rebel finishes narration signed 'Viva la Libertad -- A friend'. "Please take it so I can get the hell out of here." ¡Libertad! was a political writing of Richard Drucker. Micah Sanders hacked corinthianlasvegas.com and found a poster advertising it. For images from Libertad, see images from Libertad. For the transcript from Libertad, see the Libertad transcript. 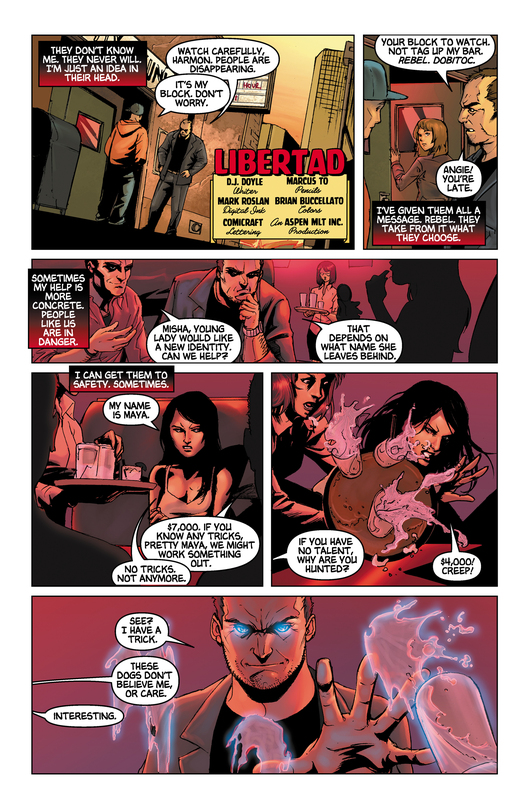 For other uses of Libertad, see Libertad (disambig).